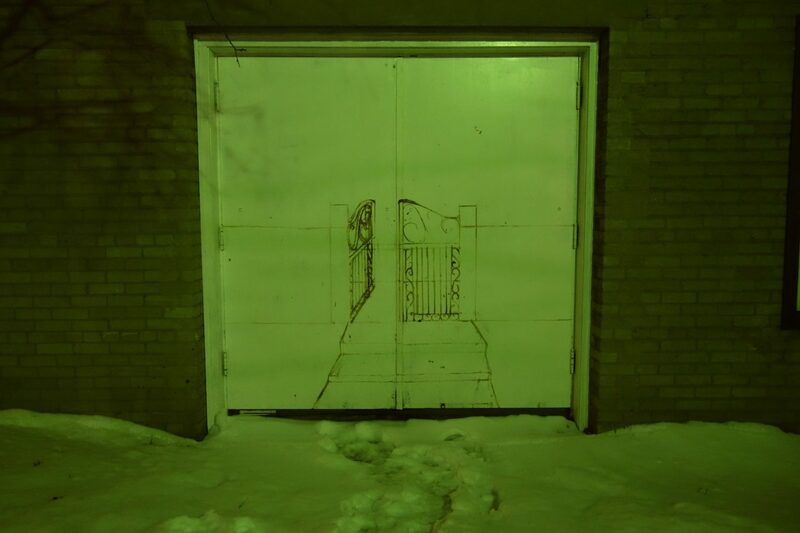 Green door being Rochester Contemporary Art Center in winter. All this sun, the blue skies and temperatures poking above 0 (Centigrade) signal the end of our cross country skiing season. There were a few grassy patches out there this morning and a lot of people with dogs. I stopped at a juncture between paths and a big brown dog ran toward me. I turned away from it and it jumped up on my back. Its front legs were on my shoulders as I pleaded with the owner to either call your dog or put it on a leash like the park sign says. I know I sound like a cranky old man and I don’t particularly like this part of me. But I was up for an hour or so before Peggi, working on my computer, as the dog across the street, trapped in the front yard while surrounded by pink flags marking his electrified perimeter, the so-called invisible fence, barked at least once for every breath I took. The dog is almost a year old now and the owners never walk it. I would be miserable too. They are inside with a big tv on in every room. Oblivious. The guy has a gun and most people on the street are afraid to talk to them. There must be a creative solution to this. Hey, I may not be the best advisor but I think all you can do is offer to walk the dog if the dog is friendly and calm enough? Or see if you can pay a kid ten bucks to walk it once a week? Likely won’t stop the barking but might ease the pain. That is a really good/creative suggestion. Thank you Louise.